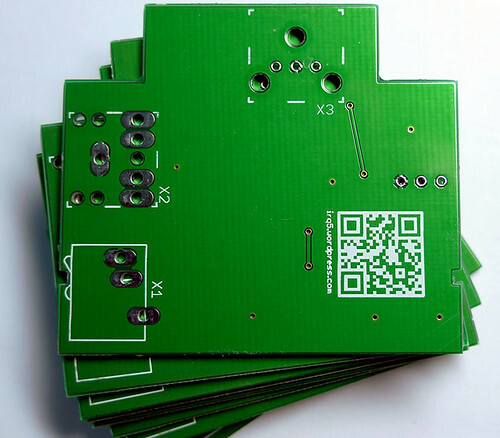 This is my first try designing and fabricating a PCB, so I decided to use iteadstudio.com since they are the cheapest available – US$12 for 10 pieces of the same 5 x 5cm board. I tried my best to make the design error-free because I didn’t prototype the circuit first (not really a good idea). I’m still waiting for the components to come in, so I can’t tell if there are any problems yet. I sent the gerbers, and they shipped the order in about 7 days. It arrived after 2 weeks (not sure if they were clearing the backlog from Chinese New Year). It was said that seeedstudio uses the same board house, so I used the DRC file and the CAM job file available in their web store where they offer the Fusion PCB service. The DRC helps you ensure that the board meets the fab house requirements. iteadstudio does not provide any such files. As the CAM file description states, the drill holes will not line up with the other layers, but the board house seems to have no problems with it. Boards that are E-tested will have a marking. This marking can be seen here on the top edge. Oddly only 4 boards are marked, even though the site states that 5 boards will be tested. Here are the front and back of the PCB. The silkscreen is slightly skewed, as you can see from the IC3 rectangle. I designed the PCB shape to fit into a case I bought locally, which unfortunately did not have any technical drawings. The good news is the board fits in perfectly. The vias are all 0.4mm and were tented. 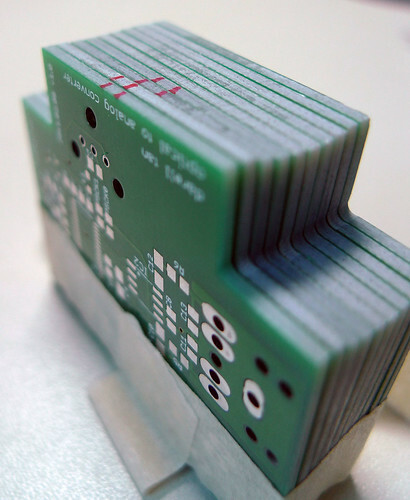 I thought this was an error, but I re-checked the design and found that the seeedstudio DRC will not generate a soldermask stop for holes smaller than 100mils. I love the QR code – it looks really nice against a green board, though I think it would look even better on red (like SparkFun boards) or blue (like Arduinos). I will talk more about what this board does, as soon as I assemble and test it. Update 12-Mar-2011: Apparently Dave Jones has also used their services and they mucked up his board by reducing copper pour around holes. He talks about the problem in episode #155 (skip to 9:20 mark).